Help build Tambo Recycling and Reuse Center! We are fundraising to help the community of Camino Real, Cusco realize their dream of becoming an eco-neighborhood! Throughout 2018, the citizens of Cusco and the staff of Ecocity Builders have gone to heroic efforts to develop an amazing grassroots eco-neighborhood plan. Through December 31st, Ecocity Builders is pledging to direct half of all proceeds raised to the first of Cusco's eco-neighborhood projects outlined in the plan, the Tambo Recycling and Reuse Center. Our goal is to raise $20,000 — $10,000 to support the general operation expenses of Ecocity Builders and $10,000 to build the Tambo Center in Cusco. The Tambo Center is positioned to catalyze a radical transformation of waste issues in Cusco while protecting important waterways, allowing for greater biodiversity and ecosystem health, and creating local jobs. A collaborative and intersectional initiative, the neighborhood teams are now ready to break ground on their vision of litter-free streets and green spaces with a jump start from the Giving Tuesday community. "We are currently working with community leaders to design the center architecturally as well as to develop a business plan that will ensure the center's success for years to come," says Fabian Simeon, a local youth volunteer organizer and member of the Sustainable Camino Real expert team. "If this plan is successful, Camino Real will have a functioning recycling and reuse center that sells recyclable materials to Cusco-based recycling companies, sorting reusable materials such as tires that can be used to build retaining walls, and a compost program to convert organic waste to nutrient dense soil for community gardens." The funds accrued through the sale of recyclable materials will support the employment of up to two community members who will work at the center. Tambo will have indoor storage and shelves to organize re-usable materials, outdoor storage to separate and store recyclable materials, an outside compost section, and an indoor community classroom/meeting space. The classroom space will serve as a location for the Camino Real neighborhood leaders and the Youth Network to meet and plan their neighborhood clean-up and beautification activities. It will also be used for capacity building workshops around waste issues. "Currently, much of the waste in Camino Real is dumped into an important wetland area that is the head of the Saphy River watershed, contaminating the waterways and accruing faster than the community organizations can mitigate," says Simeon. However, if Tambo proves to be a successful model, the Municipality of Cusco plans to replicate this solution in other neighborhoods throughout Cusco. 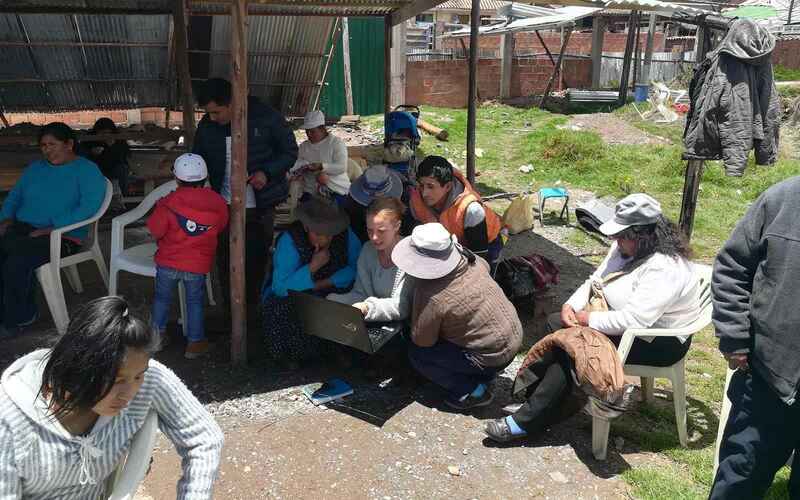 Follow along at on our blog and Facebook as Simeon and his Tambo team work with the Camino Real community members as well as local experts in Cusco to develop a detailed project plan for implementation and help make sure that this prototypal center is built and can be replicated by donating to the cause. Get ready to make it real for Tambo! I'm pleased to support the sustainable efforts of the folks in Cusco. Zero waste is the dream come true! Thank you for working to make the vision possible! Adelante El Tambo y Ecocity Builders! El proyecto me parece creativo y sostenible. Glad to support this amazing effort! I want to continue the great progress already made in Cusco.